New Albany’s street trees provide numerous benefits. As part of the urban forest, street trees absorb storm water, filter and cool the air, increase property values, and improve the walkability of the community. New Albany staff recognizes the importance in preserving, creating, and maintaining a vibrant urban forest. New Albany is a “Tree City USA” community and has maintained that designation since 2010. New Albany’s public service department maintains trees on public property and prioritizes the care of street trees in the right-of-way. 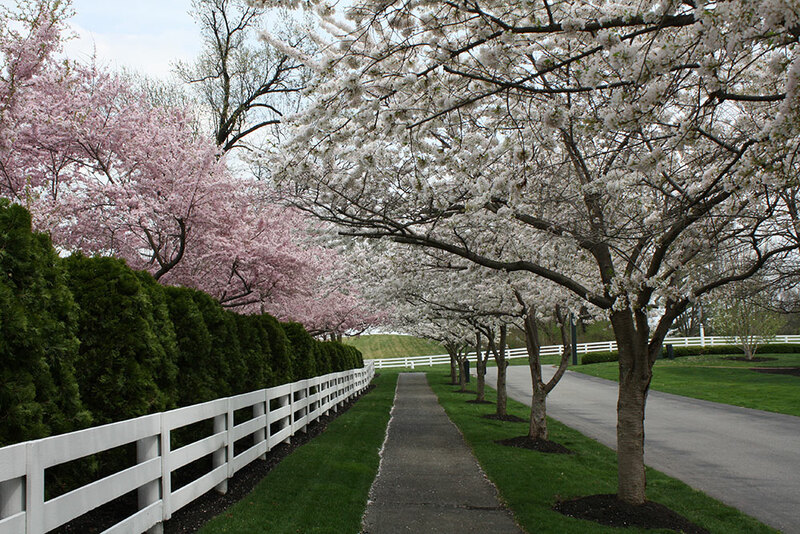 Generally, trees located on a homeowner’s private property are the homeowner’s responsibility to maintain. Throughout the year, public service crews actively prune, plant, and remove trees along city streets to encourage growth of a strong, healthy and attractive urban forest. If you have a question or concern about a street tree, please complete the Tree Evaluation Request Form at the bottom of this page. Property owner or Homeowners Association (HOA) with a street tree concern contacts the New Albany Public Service Department through the below form. Residents in the New Albany Country Club Community Association are required to contact their HOA. New Albany Public Service Department will evaluate tree(s) and respond via email within 30 days with a recommended action. If tree removal is recommended, the City or a selected contractor will remove the tree and provide stump grinding. The property owner or HOA will be responsible for a cost sharing payment of $150.00 towards each tree replacement and will receive a Tree Installation Request form with payment due. All tree replacements will be scheduled following receipt of payment for autumn. Property owner will be responsible for critical early care of newly planted trees including watering, mulching & fertilizing as needed; the City will provide information regarding the proper care of newly planted trees. The New Albany public service department schedules tree plantings every autumn, according to species availability and requirements. The city shall have sole discretion over the selection of species for all new tree plantings and will install new tree plantings on a first-come, first-served basis. Newly installed trees shall be no less than a two-inch caliper. Each new tree installation will be performed under the guidance and inspection of New Albany’s public service staff. Proper watering during the first two years after planting is the most critical maintenance requirement. Property owners should water the tree in its first and second year. Keep the soil moist but not water-logged. Water trees once a week barring rain, and more frequently during hot, windy weather. Check soil moisture by inserting a garden trowel two inches into the ground, and then moving the blade of the trowel back and forth to create a small narrow trench. Touch the soil. If the soil is moist to the touch, hold off on watering. When the soil is dry below the surface of the mulch, it is time to water. Continue until mid-Autumn, tapering off as lower temperatures require less frequent watering. Mulch the base of the tree, but avoid mulching more than two inches deep. It is also important to keep mulch pulled back one to two inches away from the trunk of the tree to prevent moist bark conditions and the potential for decay. Mulch is organic matter spread around the base of a tree to hold moisture, moderate soil tem­perature extremes, and reduce grass and weed competition. Com­mon mulches include composted wood chips, shredded bark, leaf litter or pine straw. A two inch deep layer is ideal. More than two inches may cause a problem with oxygen and excessive moisture levels. Piling mulch against the trunk of a tree may cause decay of the living bark and elicit girdling root growth, which hinders the tree’s vascular system. Fertilizing is not recommended until two years after planting. When trees are spaded and transplanted, a large percentage of the root system is removed. Because the new tree’s root system is limited, fertilizer salts in the root zone can lead to increased water stress and the burning or scorching of foliage. Fertilizer should be avoided in the first two years unless it is designed for transplant shock recovery, such as root stimulator or mycorrhizal fungi products. The emerald ash borer (EAB) was identified in Ohio in 2003. Since then, the Ohio Department of Agriculture has been battling the pest through detection, regulation, education and eradication to protect Ohio’s 3.8 billion ash trees. EAB was identified in Franklin County in 2009. EAB insect kills ash trees within three to five years of infestation by eating the cell division layer of the trunk. Larvae spend the rest of the year developing beneath the bark. To date, infestations have been identified in 59 Ohio counties. D-Shaped exit holes in the trunk (1/8” in diameter). Serpentine, S-shaped tunnels just under the bark. Creamy white larva (1” in length) just beneath the bark. Thinning tree canopy and top die back. Unnatural shoots sprouting from the trunk, or base of tree. Thin, short, vertical splits (2 – 5”) running through the bark. Unusually heavy woodpecker activity, particularly during the winter months. This form to be completed by: Property owner, property management company or HOA representative, to inform the New Albany Public Service Department of street trees in need of removal and replacement. Trees add character to our neighborhoods, cool our homes and cities, clean our air and increase property values.